Do a quick search on the internet for the baby humidifier and you’ll see countless choices. Some of the units are cute and seem perfect for a nursery. They come in shapes like monkeys, penguins, and other animals, but how well do they work? Do they provide the necessary amount of humidity to help your baby? 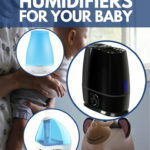 In the quest to find the best humidifier for babies, you should be looking for one that has the features that will make your life easier, your baby’s health better, and won’t break the bank. Read on for more information on why a humidifier is a good addition to your baby’s nursery, which type of humidifier is the best choice, and the features that are most important (and those you can live without). Don’t forget to check out the best baby humidifier reviews where you can compare what others have to say about their own experience with each unit. Which Features are Most Important for a Baby Humidifier? Can Humidifiers Help with Allergies?